It must have been in autumn of that year, and probably it was towards dusk for the sake of being less conspicuous. And yet a meeting between two professional gentlemen representing the chief branches of the law should surely not need to be concealed. "There is only one way for you to be completely safe," Henrietta said to me. "You must die." At my last sight of her, she was still standing motionless holding her hands crossed in front of her in the centre of the square of trees beside the dead stump where Miss Lydia's lover had died by my grandfather's sword. 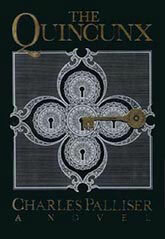 The Quincunx is an absolutely stunning literary achievement. Much more than that, it's a great read. A lot has been made of its technical brilliance. The late-twentieth century author Charles Palliser has created a novel in the style of the great mid-nineteenth century English authors—especially Charles Dickens, but also Wilkie Collins and others—right down to pre-Victorian London setting, the grimy atmosphere, the language, the people, the intricate plotting and the concern with the plight of the poor. But it's also an exciting, involving mystery that moves along—for the modern reader—faster than the monumental works of Dickens or Collins ever did. Throughout this very long novel, we can barely wait to find out what happens next to our plucky hero, young John Huffam (which happens to be Dickens's middle names). We follow his fall from a comfortable life into poverty, as he becomes both fugitive and seeker of truth in a web of intrigue, and of course through his hard-won, near-miraculous rise back into the ranks of affluence. Well, maybe that's putting it too strongly. There are times when it seems the intrigue is going on too long, it's becoming too baroque, there are just too many twists placing seemingly insurmountable obstacles in Johnnie's way. This is a book that comes with not just one but several family trees, updated periodically as our hero untangles the mysterious characters in his family, along with maps of London and a list of characters. The latter list has over one hundred and eighty names, which gives you an idea of the novel's complexity. But this shouldn't scare you off. You may need to consult the list now and then to recall a long-ago mentioned figure, but the characters are memorably drawn in the Dickens manner—with colourful monikers, like Quiggs, Mrs Sackbutt, Mrs Peppercorn, Jemima Fortisquince, Blueskin, Digweed and Sukey Podger. Palliser (himself of the famous fictional name) must have had a ball making them up, each invested with eccentricities of speech and behaviour to engage your attention. A major disappointment for me came when I realized two of the quirkiest characters, Silverlight and Pentecost, had been dropped from the ongoing plot. These two Falstaffian rascals in the Falstaff were a welcome relief from some of the drearier plotters and malefactors who eventually come to dominate the story. A lack of Dickensian humour is a criticism regularly levelled at this novel. The narrative keeps moving along quickly though. One departure from Victorian writing on Palliser's part is that he keeps the paragraphs shorter—long descriptions are eschewed in favour of a more contemporary quick-drawing style of introducing people and places. Another difference with Dickens-era novels is the overall ironical tone and the moral ambiguity which spring from our time. Every character, including Johnnie, is doubted, as are all grand notions of Justice. The book is much more cynical than Dickens, even in Bleak House. Even the aim of our hero's quest is questioned and at several points you may become skeptical of his motives. For much of the novel, he's its unreliable narrator. If my intuitions can be trusted, a different solution to one of the larger mysteries having to do with Johnnie's dead father, which is ostensibly solved near the end, may be suspected. Everything is wrapped up neatly in the conclusion, or so it seems unless you start asking questions. Palliser seems to be giving us the choice to either take the complete story as it is—and many of us will gladly do so and be rewarded for it—or delve deeper and, with our post-modern outlook, leave threads unravelled, as in real life. I wouldn't be surprised if a sequel had once once considered, but now, a couple of decades later, none seems to be in the works. Palliser returned to the Victorian-style novel with The Unburied a decade after, but the saga of The Quincunx has ended without ending, if you know what I mean. There were predictions when this book became a bestseller that it heralded the return of this kind of novel to popularity. This hasn't happened, mainly because it is so very difficult to write. An anomaly in the late twentieth century, but a wonderful one.